Awards That My Parenting Page Has Won!! Georgina's Piglet's Award: Awarded to my page on Dec. 10, 1998 (My birthday!!). Please visit Georgina's Winnie the Pooh Page!!!! The Puppy Place Award: Awarded to my page on Jan. 2, 1999!! Please visit Brit's Blue's Clues Puppy Place!! The Family First Award: Awarded to my page on Jan. 5, 1999!! Please visit theFamily First homepage!! TheParriet's Pooh Award: Awarded to my page on Feb. 20, 1999!! Please visit the Parriet's Pooh Place homepage!! 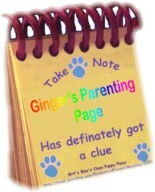 The 20ish Parents Cool Site Award: Awarded to my page on Mar. 19, 1999!! Please visit the 20ishParents homepage! !